Robyn Vilate: how we wore & cheerfully charmed winner! how we wore & cheerfully charmed winner! 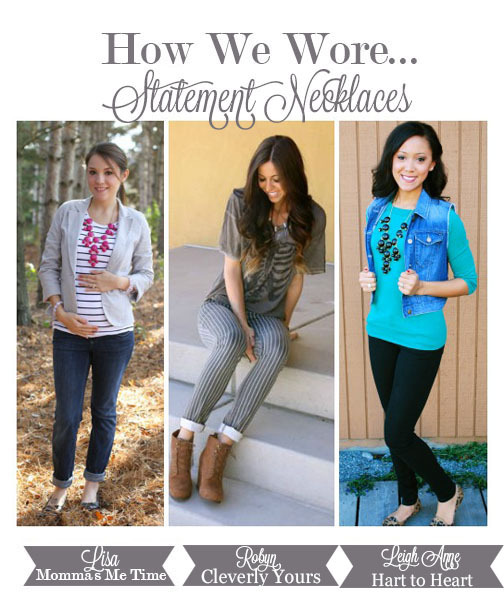 how we wore... statement necklaces! you think i would pick one that stands out a little more. however, this is probably one of my favorites. anyone who follows the blog knows how much i love the big bubble, colorful, statement necklaces, but this simple, spiked necklace is always an easy choice when i'm putting together a slightly "edgier" look. and although it doesn't necessarily follow suit with the other necklaces shown here by leigh anne and lisa, this necklace definitely makes a statement! also, side-note: pictures were taken in front of the new house and more photos are soon to follow! keep posted! also, congratulations to kady- winner of the cheerfully charmed orange adorned bib necklace! Done&Done! I did steps 1-3. As for step 4 this is the perfect fall necklace, I would wear it with anything and everything I could!! Crossing my fingers:) Thanks for sharing your amazing blog! email me @ robynstewart4@gmail.com to claim your new, amazing necklace! i want those booties! super cute! Think I'm going to be picking up a pair of those booties! You are just SO beautiful & I adore your style. ove this look and the shirt is perfect for today! newest follower, im digging those pants! congrats to the winner! LOVE this outfit! Totally loving the skeleton shirt. Perfect for the Halloween week!